Christian mother Asia Bibi continues to remain in Pakistan, despite open threats against her life from Islamist radicals who are desperate to “finish the job” and execute the harmless mother of two. Despite the fact was acquitted by the Supreme Court on bogus charges of “blasphemy,” Bibi’s life continues to hang in the balance. In addition, Prime Minister Imran Khan continues to little to stop the religious fundamentalists who are hell-bent on unleashing their demonic fury upon this innocent follower of Jesus. The UK is still not offering asylum to Asia Bibi. Khan initially appeared unabated and firmly appealed for calm following the explosive protests that erupted among the Islamist fanatics who were enraged by the courts sweeping away of the decade-old blasphemy charges leveled against Bibi. Then, he caved, offering the radical, terror-affiliated political group Tehreek-e-Labbaik Pakistan (TLP) a deal – the Supreme Court ruling would have to remain, but Bibi would not be able to flee the country. It was, in effect, a second signing of Asia’s death warrant. In a country where politicians have been shot dead in broad daylight for speaking out publicly against the nation’s draconian blasphemy laws, Bibi would now become a sitting duck and an almost certain victim of Pakistan’s culture of savage vigilantism. Released last week from her squalid prison in Punjab province, Bibi was transported to an undisclosed location in Islamabad as various governments continue to figure out a way of getting her away from the blood-thirsty Islamists. The ability to fly abroad remains a key factor in this horrifying case, as Bibi attempts to seek asylum in the West. So far, Bibi’s husband Ashiq Masih has appealed for help from several nations including the UK, US, Canada, with no success. The government has issued mixed messages about Bibi’s ability to travel abroad, initially saying that it had struck a deal with radical clerics and ordered that the embattled woman is put on a no-fly list. More recently, however, a spokesman for the Pakistani Foreign Office suggested that Bibi was free to leave. Bibi’s husband Sadiq Masih has said the family is in grave danger and has made several pleas for asylum in the UK, US and Canada. So far, there have been no official offers of asylum from either of those three nations. Despite gaining huge swathes of support from many in the UK, the British Government has stopped short of granting Bibi and her family a home in the European nation. Why? Many MP’s and MEP’s are outraged by the government’s sluggish response to this desperate woman’s plea. But according to Wilson Chowdhry of the British Pakistani Christian Association, who has been campaigning on behalf of Bibi for a number of years, the UK government is concerned about “security” and potential reprisal on embassy buildings. Former British Foreign Secretary and ex-Mayor of London, Boris Johnson, also called on the UK government to act. “I am well aware, as a former foreign secretary, of the constant threat to our overseas missions but we cannot allow the threat of violence to deter us from doing the right thing,” he said in a letter to Home Secretary Sajid Javid. A lot of words, but no action. Indeed, there are plenty more lofty statements of support being offered by leading officials from countries across the globe, and yet very few of them seem to be actually stretching out a hand. “We urge in the strongest possible terms the Government of Pakistan to guarantee safe passage for Asia, her family, and any of those under threat due to their part in the decision to acquit her, to any country that accepts them,” the letter reads, adding that “the rule of law and the fundamental human rights to freedom of religion and expression,” should be upheld in this highly troubling situation. “We celebrated the decision of the Supreme Court to acquit Asia Bibi and were pleased to see the government defend the judiciary in the days that followed. However, it has since been reported that because of the political deal struck with Tehreek-e-Labbaik Pakistan, Asia Bibi is, once again, effectively on death row. We are aware that a review of the Supreme Court verdict could take years, leaving Asia incarcerated for that time or vulnerable to mob violence if released. We understand that the decision to review the ruling was made for political, rather than legal, reasons. The letter urged “in the strongest possible terms” the immediate release of Bibi from the nation of Pakistan. There is, however, a glimmer of hope. In recent days, it has been reported that the European nation of Italy has made an offer of asylum to Bibi and her family. Whether that will really happen, however, remains to be seen. Late last week, Pakistan’s foreign office spokesman Mohammad Faisal dispelled rumors that Bibi had been smuggled out of Pakistan. Asia’s lawyer Saif Mulook, who has fled to The Netherlands, previously told AFP that Bibi was “on a plane but nobody knows where she will land,” which led many to believe, and report, that Bibi was on a one-way ticket out of the country. But, as was confirmed by Faisal, Bibi is still in the Middle Eastern nation, albeit under armed guard for her own safety. However, in its appeasement deal with the TLP, the Pakistani government said it would not block any appeals lodged against the Supreme Court’s ruling. If an appeal was to be successful, Bibi’s ordeal could be far from over. It is a devastatingly uncertain time for the 53-year-old, who was absolutely flabberghasted by the ruling. “I can’t believe what I am hearing, will I go out now?” she said at the time. “Will they let me out, really?.” Heartbreaking words from a woman who was understandably cautious about celebrating her newly granted freedom. She, more than anyone, likely knew that her fight was far from over. 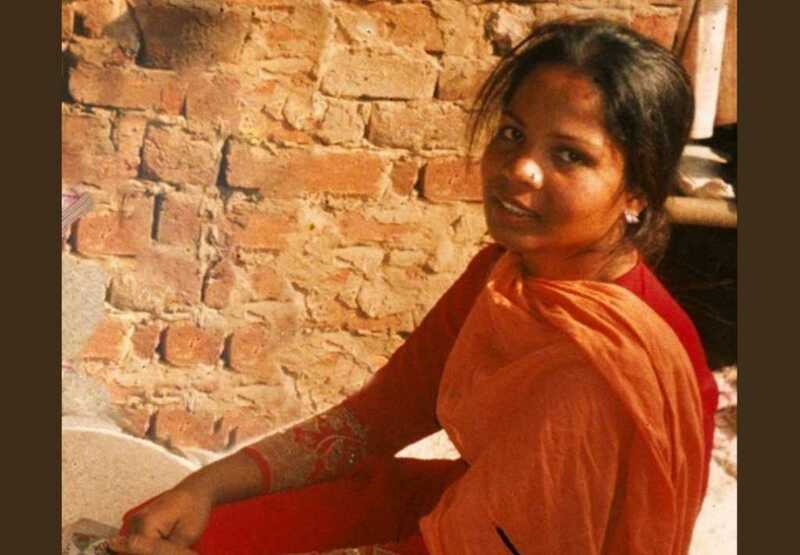 Pakistan’s Supreme Court quashed the conviction of Christian mother Asia Bibi on October 31. Bibi was initially arrested back in 2009 after supposedly entering into an argument with a group of women about a source of drinking water. The Islamist women accused Bibi of drinking from the same tap as them, to which Bibi allegedly responded, “Jesus Christ died for my sins. What did the prophet Muhammad do for you?” a remark which they believed offended their revered religious figure. The radicals, however, have remained blood-thirsty from the very day Bibi was arrested. Prior to her acquittal, in Pakistan’s second-largest city of Lahore, hundreds of protesters gathered together and chanted “Hang infidel Asia.” Sickeningly, the hashtag #HangAsiaDefend295C was trending among the religious extremists on Twitter, with the 295c referring to “295-C” of Pakistan’s penal code which makes it a criminal offense to blaspheme against the Prophet Muhammad. There is no doubt that until Bibi is successfully extracted from Pakistan and granted asylum in a safe and civil country, her life continues to hang in the balance.